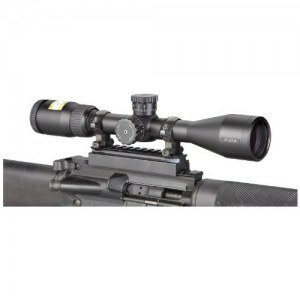 A common nightmare for any target shooter or deer hunter without a doubt is scope problems. Without a properly functioning scope, the shooter's aim can vary significantly. This affects whether or not a deer is hit and how close to the target the shooter lands. In the following paragraphs you will find some of the most common rifle scope issues and some suggestions for correcting them. Scope shift is perhaps the number one problem with rifle scopes. This is also referred to as point-of-impact, or POI shift. POI means the relationship between where the shooter is aiming or sighting and the destination where the bullet actually hits. When there is a noticeable discrepancy, then POI shift has occurred. Ironically, this is not an issue with the scope itself, yet a user problem. Often, POI shift is experienced by new scope owners; although, some veteran shooters may find themselves in the same boat if they begin using their scope in a new way. For this type of gun, the top reason lies in the manner in which the gun is held. Because of the delicate and sensitive nature of spring guns, group impact sometimes is moved many inches when operated at close range. Due to the vibration patterns of this sensitive system, it is vitally important to remedy this issue by acquiring a holding style and repeating it each and every single time the gun is shot. Parallax is the most common reason for rifle's scope shift. Again, it is not the scope that is responsible for this movement, but the inconsistency of the shooter. Sometimes new shooters will discover the parallax correction adjustment, or AO wheel, and figure they can focus on the target with no problems after a quick turn of this wheel. This is not the case. Parallax involves 3 different places so there will always be some parallax. These 3 places are the reticle, target and line between your eye and them. A good scope can correct this problem for the most part; however, the issue is more relevant for a target shooter than a hunter. For example, a pellet landing .4 inches from its intended mark is a disappointment to a target shooter, whereas a deer hunter doesn't mind if he hits the fourth or fifth rib of the deer as long as it makes contact. https://www.youtube.com/watch?v=NV0Giewg4zQ Probably the next biggest reason for scope shift is seen when the elevation is adjusted too high. There is an erector tube, where the reticle is etched, and it can move creating a "floating" appearance. This happens because tension of this tube relaxes when elevation is too high and it is no longer able to firmly hold between the adjusted action screw and springs. Correcting this can be done by simply not adjusting the reticle too high. Another misconception when shooting is that once the mounted scope has been leveled, everything is ready to go. Depending on the range used, the scope may need adjusted. The reticle must have optical centering. Even though this is generally too small to be detected by the naked eye, the barrel of the rifle practically never gazes in the same direction as the scope itself. If you find your rifle tilting to one side or the other, this might be your problem. This occurs when groups are moving .5 inches - .75 inches. Check out the B-Square level to fix this issue since it sticks out and is ambidextrous making it easy-to-use. With all of the scope problems out there, be sure to check your handling. The more consistent hold, the less problems you will likely experience. Make adjustments as necessary, but don't over do it. Get a grip and save it in the memory bank to make every shooting expedition the best it can be.